Milk is processed, packed and stored under hygienic conditions, thereby avoiding bacterial contamination and multiplication. Milk products are manufactured under hygienic conditions with strict quality control. In the dairy plants having ISO 9002 and capital HACCP certification. Mahanand Dairy is using Solar Water Heating system (25000 litres capacity). Since 1990, which was commissioned with the assistance of Department of Non Conventional Energy sources and Maharashtra Energy Development Agency. The water is heated from ambient to 85ºC with the help of solar water heating system, which is used for boiler as feed water and crate cleaning & general cleaning purpose. This has resulted into a saving of 200 - 250 litres of furnace oil per day, with monetary savings of appx. Rs. 4 Lacs per annum. To improve environment and ecological balance extensive free plantation programme is undertaken within the Dairy premises, for treating Dairy waste water. 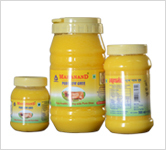 Mahanand Dairy is using most advanced effluent treatment. 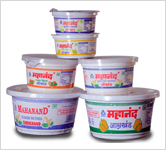 By adopting proper plant sanitation and quality control measures, the shelf-life of Mahanand Milk at ambient temp. could be improved upto 16-17 Hours. 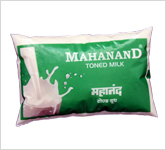 The excellent quality of milk has increased the consumers acceptability and satisfaction, thereby making Mahanand Milk most popular in the market . 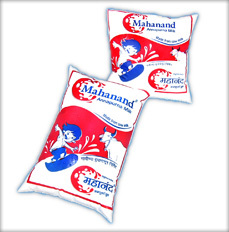 To prevent market complaints and to have effective control over milk adulteration in the market, Mahanand Dairy has introduced very effective coding system on milk pouch. This gives the details of date of packing, machine number, filler number, place of packing, etc. 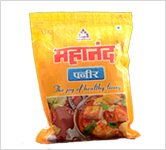 on each and every pouch packed and distributed in the market. This has helped us in controlling market complaints and to implement effective corrective measures at Dairy plant to achieve desirable parameters. The system is found to be very useful and effective in solving marketing and distribution complaints. 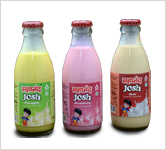 Some members of Dudh Mahasangh are having excellent milk products manufacturing facility with ISO certification . These members shall be manufacturing products under Mahanand Brand name as per the quality standards prescribed by Mahanand Mahanand Cheese, Mahanand Butter, Mahanand Ghee, shall be manufactured and launched in the national market very soon. MRSDMM is giving financial assistance to member unions for establishment of chilling centres . So far, financial assistance to tune of Rs. 6 crores has been granted to 20 milk unions for this purpose . This amount is recover thorough milk bills. At present, 56 member unions are supplying milk to MRSDMM at Mumbai , Pune, Kudal, Nagpur & Wardha .